A couple of weeks ago an envelope arrived containing 2 sheets of paper – the judge’s critique from the Text on Textiles exhibition. At first I was a little disappointed, but hey I actually got chosen to take part in the exhibition so the quilt must have achieved a certain standard. Having had time to digest the comments I have reached the point where I can use the critique to determine areas for improvement, although as yet I’m not sure how to go about improving. I guess it’s down to practice makes perfect. Basically there were 3 levels for the judging – excellent, satisfactory and needs improvement. Not much grey scale in there, but I suppose it makes for more standardised judging. I didn’t get any “needs improvement” so that was a relief, but didn’t help me much with my search for areas to improve on. One judge gave me half and half excellent and satisfactory, the other about 2/3 excellent to 1/3 satisfactory. Where they both agreed, was that my technical skills were excellent, e.g. piecing, quilting technique, etc. The latter pleasing me no end as I personally feel there is certainly room for improvement there. Both gave me an excellent for “original in design” – another big boost to my confidence – and in fact one of them noted that one of the best features of the quilt was that it was very original. So what are the areas that need improvement? Well both agreed that the “visual impact” and the “integration of all design elements” were only satisfactory. So obviously I need to do something about both of those. I wish I could find more photos of the quilts in the exhibition, especially of the winners. I would like to be able to compare mine to the others to see where the differences lie. I suppose I shall have to revisit the principles of design again and try to analyse what worked and what didn’t work in my quilt and repeat the exercise for other quilts that have been singled out by others as being top notch. This is where it would be useful to know which quilts were the winners. It’s one thing to know what was not up to scratch, but it’s quite a different thing to work out what needs to improve. I thought I should try and do a couple of pages in the sketchbook this weekend. It has been about a month since I did anything. I’ve not had many ideas really, being totally stressed out at the moment with work and the house in Spain project. I was clearing away a pile of emails and route plans and brochures from the in-tray, mostly related to the move to Spain and the house project, but some quilty ones too. And I thought maybe I would use the difference texts, fonts, etc to make another collage in my sketchbook. It kind of fits in nicely with the first venue of the Text on Textile exhibition having just come to an end – words as design. The collage is inspired by some of Paul Klee‘s paintings based on a grid of coloured squares. I am drawn to those paintings and those of Ton Schulten as inspiration for quilts. 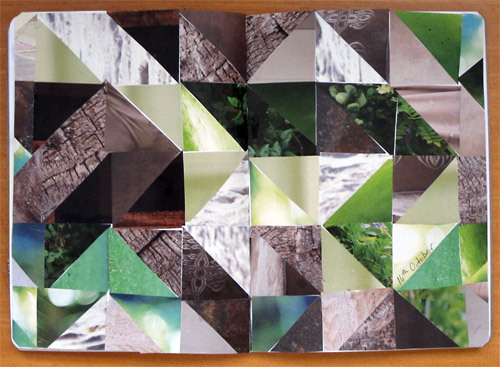 Of course this collage is not about the colours but about the shapes. The photo was taken with flash as the days as so short now that the daylight was gone before I was finished. But you get the general impression. As the first showing of my quilt in the Text on Textile exhibit at Houston ended today I guess it’s now ok to post a picture of it on my blog. I find it very frustrating as it is always almost impossible to find many good images of the exhibition on the web and it is far too far for me to travel to actually see the exhibition in person. I have much higher priorities at present for spending my money than taking trips to the US. I did find this gallery of photos on the IQF website Quilt Festival at Home. According to my information there were 26 quilts picked for the exhibit, so there are less than half of them shown in the gallery. Also no information about the results of the judging. It would be nice to know which quilt was chosen for the award. The special exhibits seem to be a bit of a poor relation at the IFQ. Apart from the galleries on the website they receive minimal publicity. At least I’ve found next to nothing by googling. The most information I found was on this blog at chron.com, which appears to be the online presence of the Houston Chronicle newspaper. So here finally I present Use Your Eyes, my last quilt made before packing up the studio for its move to Spain. 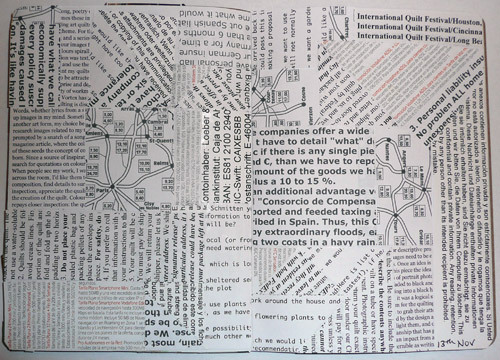 The quilt explores the idea of words as a design element. My inspiration came from reading about Notan, the Japanese concept involving the play and placement of light and dark next to the other. By exploring the balance of the positive and negative shapes in words and reducing the contrast in the shading so that the viewer is uncertain which shape is the positive and which the negative, the text presents a visual challenge. The intention is that at first glance the words should not be instantly recognizable. The challenge to myself as the designer was to use the complementary colors of red and green, but to achieve a balance in the values in each word to support the uncertainty regarding the positive and negative spaces. I chose a favorite quotation by the Australian artist Ken Done for my text and arranged the words as a word cloud giving greater prominence to words that appear more frequently in the source text. 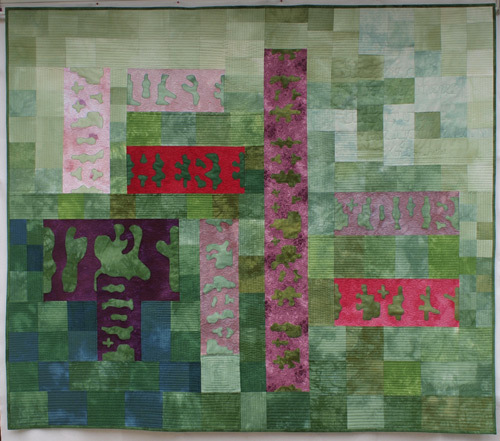 The title of the quilt Use Your Eyes is taken from the quote and is meant as an invitation to the viewer to stop and study the quilt and discover the text in the design. As for my new studio: I was in Spain for 10 days getting back last Wednesday. We were supposed to take possession of the house on the Tuesday, but things didn’t go according to plan. There is still work going on inside the house – bathrooms not finished, painting still to be done etc. We camped in it, in a fairly primitive manner, from the Saturday and poor Sqeze is camping there still. The kitchen was handed over to him on Friday, so at least he will be able to eat more than bread and cheese soon. It will be a while yet before the studio can be commissioned. There wasn’t anything particular that caught my attention in the last week to merit a sketchbook page, so I returned to my roots as it were and made a little patchwork from paper. The design was inspired by quilt patterns that I have seen that remind me of pathways or trails. One was called the Oregon Trail that I found a few years ago now on a website that no longer appears to exist. Another is the blended triangle pattern from Barbara Dieges. My little paper quilt doesn’t quite form a trail. There wasn’t enough space on a double page and I didn’t have the patience to cut my triangles any smaller, but I am quite pleased anyway with the result. I like traditional quilt blocks, but put together with a twist. I haven’t ever made a full sized bed quilt. I keep thinking I might, but then some other idea takes precedence and the traditional quilt never gets made. That is actually not quite the truth. The first quilt I ever made was back at the end of the 1970s. I hand pieced a double bed sized quilt using the English paper piecing method and the grandmother’s flower garden pattern. As I’d never seen a patchwork quilt at the time I didn’t know it should have three layers so mine was just lined with curtain lining and didn’t have a proper binding on it. In fact it started out as a single bed quilt, but I got married before I’d finished it so it grew into a double bed quilt. I still have it, but the curtain lining shrank so it doesn’t lie flat any more. Another thing I didn’t know then, was that it’s good idea to wash your fabric first! So here’s my little paper quilt. I was interested in getting some texture into the pattern by using different images torn from a magazine. The other thing I like is the contrast between dark and light as in the log cabin patchwork block, so I was experimenting with light and dark triangles. 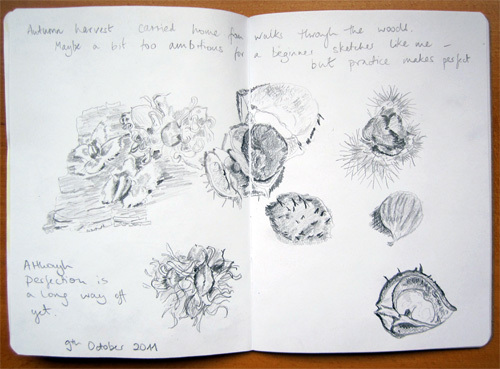 I’ve had an arrangement of nuts, picked up on one walk just up the road from us, sitting on the dresser waiting to be included in my sketchbook. 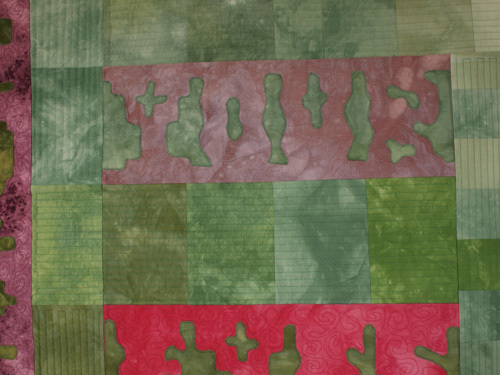 I was actually thinking of doing something different this week – something more along the lines of a collage, but then I discovered Geni’s new blog Moving Fibers where she is journalling about her Creative Quiltmaking course with the Kemshalls. In particular her posts about exploring greys and from colours to greys inspired me to have a go at using just pencil to sketch the fruits and nuts. It was a lot harder than I expected. Geni made it look so easy. In particular I found the light areas difficult to get right. I tried not to do much rubbing out so what you see is pretty much exactly what happened when I put pencil to paper. I am finding that drawing is really making me stop and look at things in much more detail. Maybe using a pencil instead of tearing up bits of paper is a very good exercise for me right now. Getting my eye trained to appreciate the minutiae. 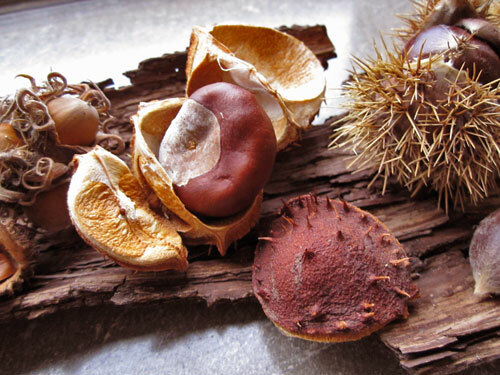 Here is my little collection displayed on a piece of bark that I picked up to carry it all home on. I started off trying to include the bark in the sketches too, but that was a bit too challenging for working in just grey so I left it out as I continued to work. 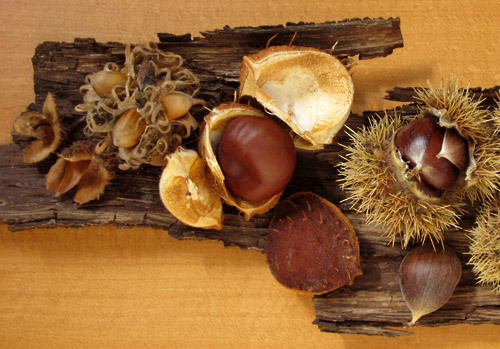 I don’t know what the nuts/seeds are in front of the Constantinople hazelnut. They were difficult to draw as they got lost in my bark background. 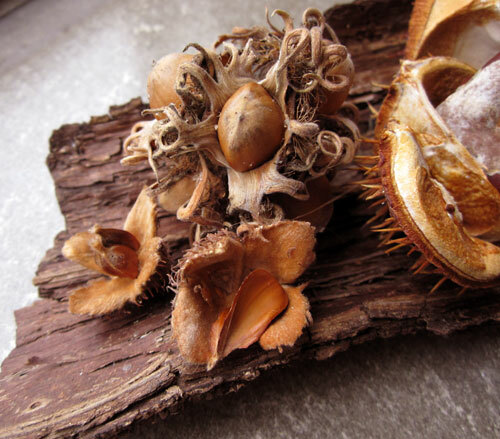 I found it hard to get the depth of field right in the horse chestnut husks. They have such lovely rounded cavities, but I didn’t do them justice in my sketching. This sketchbook is all about my journey of discovery in using a sketchbook. I’m not sure that will be apparent to the people who might look at it once it joins the collection. I don’t have the space in the little journal to write all this stuff that I am putting up on my blog. Pity really, but I hope they enjoy it anyway. You may remember that I posted about taking photos in the rain. We did have an ulterior motive for doing so. I sent the photographs to Lark Crafts in the hope of them being accepted into the new book Art Quilt Portfolio: People & Portraits being prepared. The original date for hearing something was mid-September if I remember rightly. So I had more or less given up on the idea that I just might get into print. Well today I received an email to tell me that I’ve made it into the second round of judging for inclusion into the gallery section of the book. Apparently there was such a huge response that a second round became necessary. 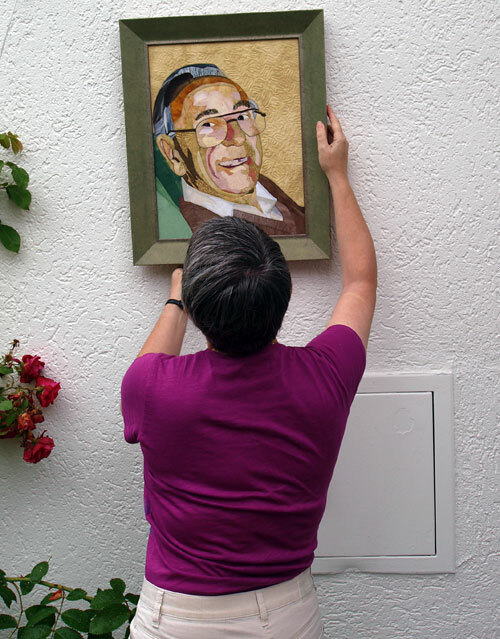 Now I have to wait until early 2012 to hear whether Dad’s portrait makes it into the book or not. I also have to get through the vetting process to ensure that the images satisfy the technical specifications. I don’t expect that to be a problem because Sqeze took great care to follow the letter of the law on that account – that was one of the reasons for photographing outside in the rain – to get the best light possible as no manipulation of the images was allowed. My sketchbook arrived this week. I was surprised at how small the envelope was. I was expecting something a little larger – not having taken any notice of the dimensions mentioned on the project website. 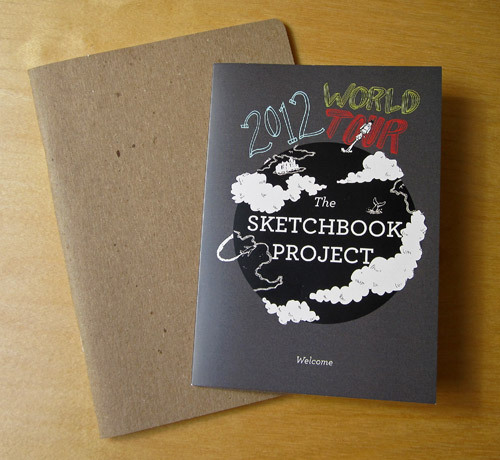 The sketchbook (with the brown cover) is 18 x 13cm – I’m not sure whether I’m pleased or not. On the one hand it certainly isn’t as intimidating as I had expected, to be confronted with blank paper that needs to be filled up. It’s quite a manageable amount. On the other hand for someone who is used to working in an A3 sketchbook, when I do use one, it will be quite a change and probably a challenge to have such a small area to use at one time. Last night Sqeze found a tiny feather in the bedroom that had found its way in through a cracked open window. So I thought that would be my starting point for “Travel with Me”. My idea is to pick a jumping off point for each set of pages of something that crosses my path during the week. Even it I don’t find anything each week I should be able to fill the pages by the deadline for posting of Jan. 31st, 2012. As I have fairly limited art supplies in my temporary abode it will also be an exercise in creating within a set of constraints. I’m not planning on buying more supplies to clutter up the flat – I don’t feel comfortable crowded in by “stuff”. I’ll see how I get on and only buy things that I really notice I’m missing. I’ve chosen the theme “Travel with me”. I was taken with “In fifty years” as that would cover most of my life story, but as it’s going to be a creative journey for me I thought travel with me was more appropriate. I’ve not read in the rules anywhere that you can’t blog about your sketchbook so there may be more to follow. The Metropolitan Museum of Art, New York is currently showing the exhibition Savage Beauty. 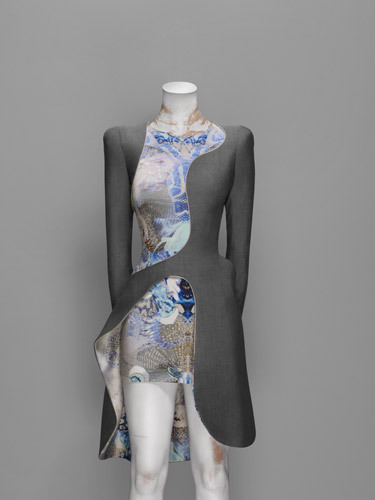 The exhibition, organized by The Costume Institute, celebrates the late Alexander McQueen’s extraordinary contributions to fashion. I read about it on Jeanne Williamson’s blog. She was lucky enough to visit the exhibition in person, but I think you can get a good impression of the exhibition by visiting the museum’s website. There are selected images of some of McQueen’s creations and also a selection of videos from some of McQueen’s runway shows and of the exhibition. The objects on display are certainly works of art and the work of a master of his profession. Reading some of the information provided it appears that McQueen was able to mark up on cloth with tailor’s chalk and when cut out and assembled the fit was perfect.